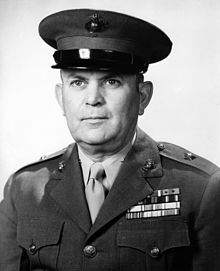 Merritt Barton Curtis, (August 31, 1892 – May 16, 1966) was a United States Marine Corps Officer with the rank of Brigadier General during World War II. He was also lawyer who in 1960 ran for President of the United States in Washington with B. N. Miller and vice-president in Texas with Charles L. Sullivan under the Constitution Party banner. Curtis also ran for vice-president in Michigan with Lars Daly under the Tax Cut banner. Merritt Barton Curtis was born in 1892 at San Bernardino, California, son of Israel Hamilton Curtis and Eliza Allen Mee. He attended the University of California, Berkeley, where he earned his Bachelor of Arts degree in 1916. Curtis subsequently entered the Marine Corps on August 10, 1917 and was commissioned second lieutenant on that date. He also married Francis Claire Bracewell on Apr 23, 1917 at Riverside, California. Curtis was assigned to the Marine Barracks Quantico, Virginia and served there during the whole duration of World War I. He was transferred to the 1st Provisional Brigade of Marine and sent for duties in Haiti on June 1, 1920. Curtis was transferred to Garde d'Haïti in January 1922 and served there until October 1923, when he returned to the United States. He was assigned back to the Marine Barracks Quantico after his arrival, but at the beginning of April 1924, Curtis was transferred to the Naval Submarine Base New London, Connecticut, where he was appointed commanding officer of the local Marine Detachment. He was later transferred at Headquarters Marine Corps in Washington, D.C., where he was assigned to the Paymaster's Office. During his duties in Washington, D.C., Curtis attended George Washington University and earned Bachelor of Laws degree in 1927. As a Lawyer, He was member of the bar in California. Curtis was appointed Executive Officer of the Paymaster's at Headquarters Marine Corps in Washington, D.C. and served there until December 1944 under the command of Brigadier general Raymond R. Wright. During his time in this capacity, he was promoted to the rank of Colonel on April 29, 1942. Curtis was promoted to the rank of Brigadier General in December 1944 and appointed Paymaster within Fleet Marine Force, Pacific. He was stationed at Hawaii and later also participated in Philippines Campaign. For his service in this capacity, he was decorated with Navy Commendation Medal. Curtis returned to Headquarters Marine Corps in Washington, D.C. in August 1946 and was appointed Chief of Disbursing Branch. He was responsible for Naval rating and for maintaining of personnel records, preparing reports and accomplishing accounting procedures. Curtis served in this capacity until his retirement from the Marine Corps in June 1949. The Constitution Party was described by Sara Diamond as the result of the "...racist Right's ill-fated efforts at forming a third party..." In 1960 the party put-up retired Marine Corps Brigadier General Merritt B. Curtis for president, and B. N. Miller for vice-president in the state of Washington. Curtis received 1,401 votes for 0.11% of the Washington vote. Curtis received 18,162 votes as a candidate for vice-president in Texas, and 1,767 votes in Michigan. Curtis died in 1966 while a resident of Washington, D.C., and is buried at Arlington National Cemetery. Denslow, William R. (2004) . 10,000 Famous Freemasons from A to J Part One. Torrance, California: Kessinger Publishing. ISBN 1-4179-7578-4. Ancell, R. Manning and Christine M. Miller (1996). The Biographical Dictionary of World War II Generals and Flag Officers. The U.S. armed forces. Westport, CT: Greenwood Press. ISBN 0-313-29546-8.